When I start making my Christmas shopping list, I always ask the people on my list if there's anything that they want. If they say something almost immediately, then that's normally my number one gift item for them but when they say they hadn't really thought about it or that they don't know of anything, that's when I turn to my "reserve" gift list. This is normally what I have to do with the moms in my life because behind the guys, moms are definitely the next hardest group to shop for. They either have everything they will ever need or they always say that they don't want anything, so a shopping strategy for them can be quite the challenge. Mom's do so much for us (usually before we even have to ask), and never ask for anything in return. 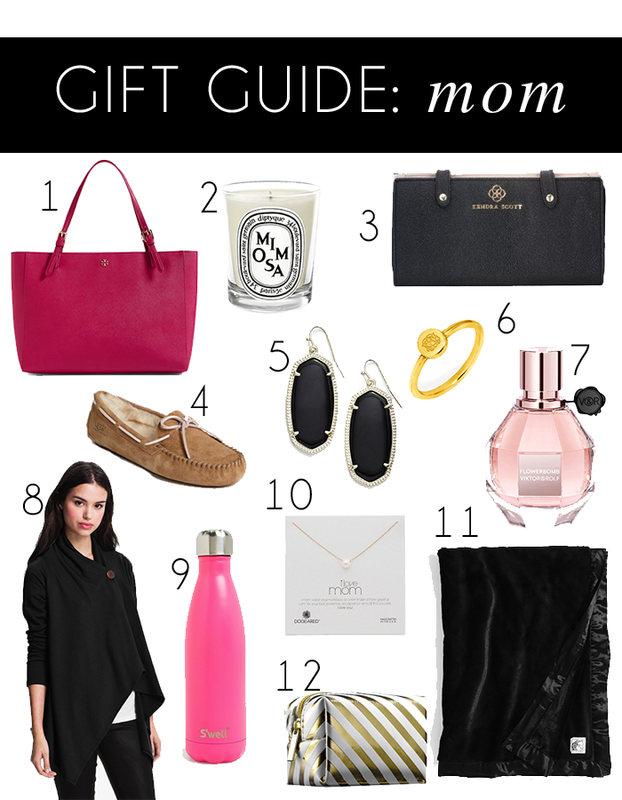 If anyone deserves a rockstar Christmas gift, it's them, so as inspiration for this gift guide I thought of things that the moms in our lives wouldn't normally buy themselves! This Tory Burch Tote is the perfect size to hold everything moms normally carry in their purses yet still super sleek and sophisticated! If you're looking for something for the perfume lover, like my Mamaw, the Flowerbomb perfume is the number one selling perfume at Nordstrom. I also picked up one of these the other day and it would be perfect for the jewelry lover or lady who's always on the go! I included some smaller items as well so if there's not a bigger item that catches your eye you can mix and match some to make a cute set of gifts for the mom in your life. I cannot believe tomorrow is Thanksgiving, but I will gladly take the two extra days to spend relaxing watching football and spending time with friends and family! P.S. Don't forget to enter the giveaway I'm hosting on Instagram before 8:00 pm EST tonight for a chance to win a Rebecca Minkoff satchel and $300 to your local chapter of Feeding America!